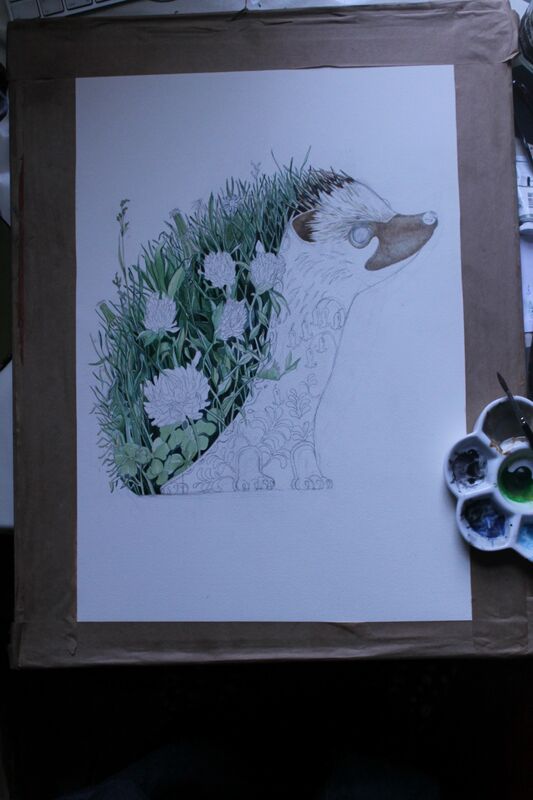 The finished painting of a hegdehog, and below the same painting in progress. The hedgehog’s dilemma is an analogy about the challenges of human intimacy. It goes like this, An Array of hedgehogs are getting ready for their winter hibernation, they start to snuggle down into their nest and cuddle up to each other to conserve heat. But they must remain apart. They cannot avoid hurting one another with their sharp spines. Oh dear! Sigmund Freud used The Hedgehog’s dilemma to describe the individuals relation to others in society. The hedgehog’s dilemma suggests that despite goodwill, human intimacy cannot occur without substantial mutual harm. We all have to have some pain from each other to enjoy some intimacy. 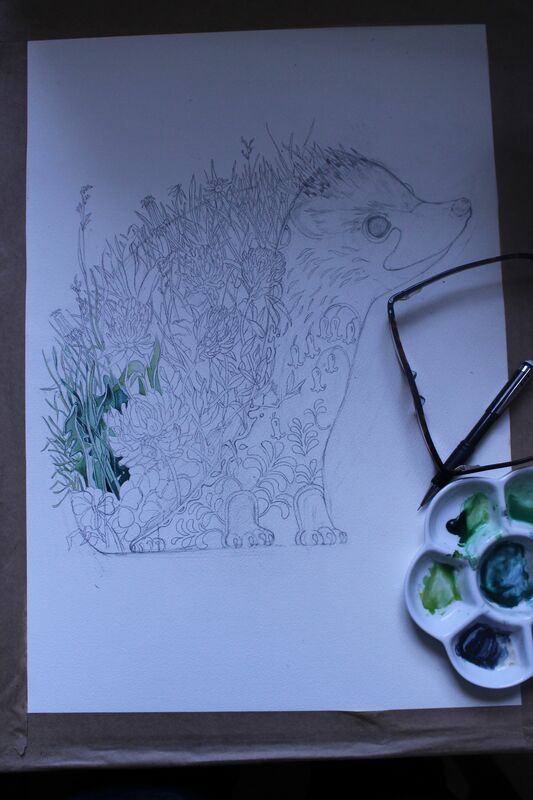 This painting of a hedgehog continues with the theme of animals in their natural habitat. The Hedgehog with a grassy bank depicted on his back. The clover flowers bringing out the green of the grass and vice a-versa. I Studied Albrecht Dürer watercolour, “Great Piece of Turf”, which is a truly astonishing painting, to get some inspiration for the grass. and I continued my thread of influence of japanese prints and the arts and crafts to decorate the belly of the hedgehog. This entry was posted in animals and tagged Array of hedgehogs, hedgehog, Hedgehog's dilemma, hibernation, human intimacy. Bookmark the permalink. 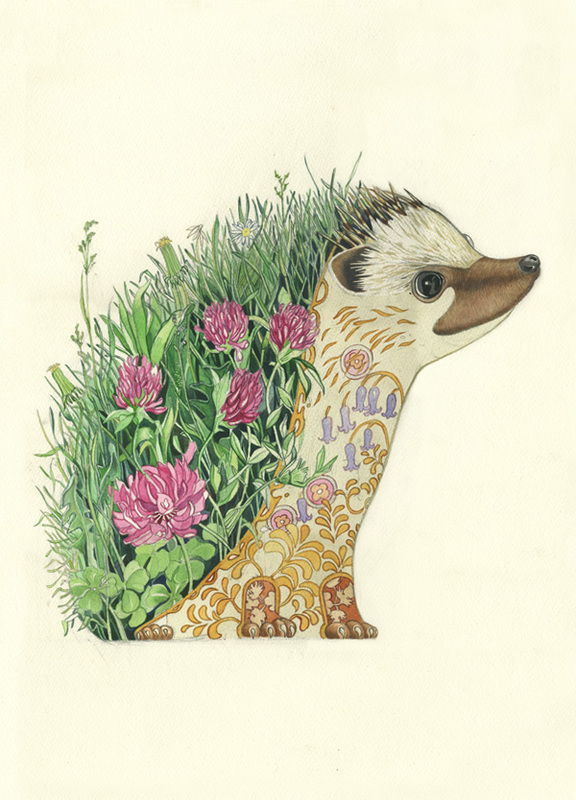 I thought you might enjoy The Hedgehog by illustrator Daniel Mackie. I really loved the back story to this fabulous work of art. Daniel is at Greenwich Market in South East London on Saturday’s and Sunday’s.